Business Continuity | Consolidated Technologies, Inc. : Consolidated Technologies, Inc.
CTI’s business continuity solution is designed to quickly revive your network and have your employees productive again in almost no time. It operates automatically to back up your vital data as frequently as every 15 minutes. If there’s a problem, files can be restored in about a half-hour, or if needed, our system can take over as a virtual server to resume operations until bigger issues with your network can be resolved. And in a worse-case disaster scenario, remote server backup is also available to keep your files and data safe and secure. Let us protect your valuable data! Not even the most conscientious users save their work as consistently and thoroughly as CTI’s business continuity solution. Servers crash, networks fail … it’s going to happen. But with CTI’s virtual server engaged and deployed, we’ll have your systems up and running again in mere minutes. Violating government rules for protecting sensitive records at the federal level (such as HIPAA or Sarbanes-Oxley) as well as state or local jurisdictions can bring severe consequences. 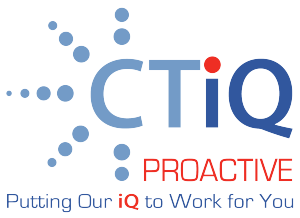 CTI’s business continuity solution goes a long way toward helping you maintain compliance. Everyone’s done it — deleted or lost an email containing critical information. Take advantage of CTI’s email recovery feature for Microsoft Exchange Servers and recover that important message from days or even months ago. It’s true; an ounce of prevention is worth a pound of cure. CTiQ Proactive Monitoring (RMM) service is included with our business continuity solution so small issues don’t become big problems.